DWI field sobriety tests – When someone is pulled over, in order for them to be charged with DWI, typically a law enforcement officer must use some method to show that there was probable cause. Part of that method typically involves the administration of certain field sobriety tests. North Carolina recognizes three main field sobriety tests. The three recognized DWI field sobriety tests are: the Horizontal Gaze Nystagmus Test, the Walk and Turn Test, and the One Leg Stand Test. In this blog, we will talk a little about all of those tests. If you want to learn more about the consequences of a DWI conviction, click here. When are field sobriety tests performed? Other ways this begins is through voluntary conversation with the driver. A police officer will ask questions such as “have you had anything to drink tonight?” or “where are you coming from?”. We talk about the importance of not making incriminating statements here. Depending or the answers to these questions or the observations that are made, the officer will typically ask the driver to step out of the vehicle. The purpose of that is to perform one or all of the aforementioned field sobriety tests. This test involves a law enforcement officer shining a bright light in the eyes of the driver and moving the light back and forth. The officer then follows the driver’s eye movements. What the officer is looking for in this situation is nystagmus, which is a certain jerking/twitching of the eyes. Different officers do this for different amounts of time. What the standard time for them to do this is never disclosed by the officer to the driver. This test involves the driver being asked to walk along an “imaginary” line, touching their feet from heel to toe for a certain distance, turning around and walking back in same way. The turn involves taking a series of small steps in a very specific, very confusing manner. This is done repeatedly and the officer looks for subjective “cues” to evaluate the driver’s performance on this test. This test is exactly as it sounds. The driver is asked to stand on one leg and maintain his balance on that leg. The officer is looking for how many times the driver has to put the other leg down, whether he falls or otherwise loses his balance and other “cues” to evaluate the driver’s performance on this test. Field sobriety test are difficult to pass, even when someone is completely sober. In addition, people are asked to perform these tests on the side of the road, under extremely stressful circumstances. Often, there are bright, flashing lights to contend with and other cars speeding by. Not to mention, the driver has just been pulled over, it’s usually late at night, he’s being investigated for a crime (probably for the first time in his life), he doesn’t know what is going on, and he is very nervous. Failure of these tests happens often, but it is not necessarily the end of your DWI case. A DWI attorney will evaluate the entire stop, and hold the officers accountable for any rules that they may have broken. Usually, you will be asked to perform a breathalyzer test. 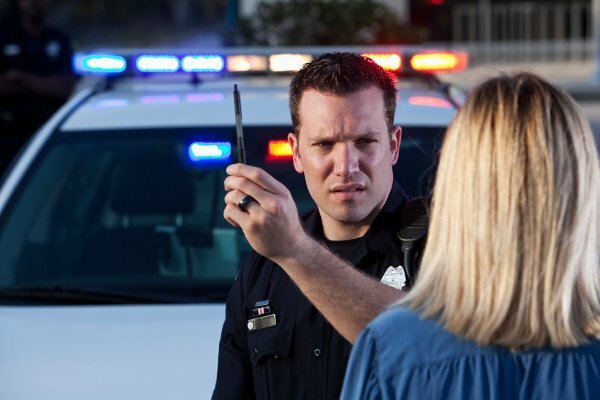 This typically happens after you perform your DWI field sobriety tests. You do NOT have to take this test, although, it may seem that you do not have a choice. Until you are formally arrested for DWI in North Carolina, you have the right to refuse to take the field breathalyzer test. Click here to learn more. If you have been charged with a DWI, contact us. At Gilles Law we handle DWI in charlotte and the surrounding areas, as well as DUI in South Carolina.